Dòuhuā can be found in restaurants, but it can also be bought from little stalls by the street to peddlers carrying around the ingredients around in two buckets hanging from a stick on the man’s shoulders. It has gone beyond China to many places in Southeast Asia, and it’s amazing how so many people could be brought together by tofu. 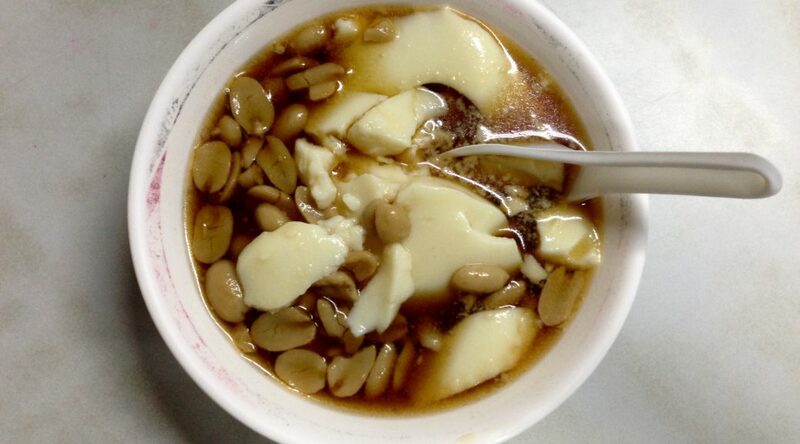 To make the soy milk, soak the soy beans for about 10 to 16 hours. Grind the soaked beans and put through a strainer. Boil the milk, then mix water with the gypsum and cornstarch. Pour in the gypsum mixture. Stir it a lot, because gypsum could settle really quickly to the bottom. When done, stir for a few seconds then cover it and let it rest. It can be served in 15 minutes by using a ladle to scoop out lumps of it. For the syrup, pour water into a saucepan, and when it’s boiling, put in the brown sugar. Ginger can then be added. Tofu originated during the Han dynasty in China. Some say that tofu came from Prine Liu An’s failed experiment to create immortality pills, others say that it came about from a Mongolian cook accidentally mixing sea salt with boiling soybeans. The creation of dòuhuā came soon after, and it is believed that douhua originated at around that same time. It was carried to other parts of Asia with the spread of Buddhism. It differs in different parts of China. For example, it is eaten with soy sauce in Northern China. In Sichuan, it can be eaten with chili oil and Sichuan pepper. It can also be found in other countries, such as Taiwan, where it can be served with crushed peanuts and adzuki beans and tapioca. In Southeast Asia, such as Indonesia, it can be served with ginger syrup and peanut. In the Philippines, specifically in Baguio, it can be served with strawberry syrup, due to the abundance of strawberries in that mountainous area.